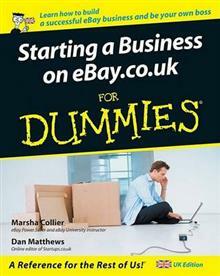 Covers the essentials an eBay user or entrepreneur needs to start a money-making venture by trading on eBay.co.uk. This book features advice on different aspects of starting and growing a business, including: setting-up shop, running auctions, delivering goods, keeping customers ... read full description below. Starting a Business on eBay.co.uk For Dummies covers all the essentials an eBay user or budding entrepreneur needs to start a money-making venture by trading on eBay.co.uk. It features straight-talking advice on every aspect of starting and growing a successful business, including: setting-up shop, running successful auctions, delivering goods, keeping customers happy, and maximising profits. Marsha Collier has a prominent profile amongst eBay users, she?s an eBay powerseller, eBay University Lecturer and author. Martha is tireless in her promotion of the Dummies books and is keen to promote the UK editions. eBay.co.uk are planning a series of events and promotions for later this year (dates to be confirmed) and have asked Marsha to participate, which she?s very enthusiastic about doing. Dan Matthews is the online editor of Startups.co.uk and contributing editor of Growing Business Magazine. He is a regular user of eBay and has written several articles on staring an eBay business. Dan has written for a variety of publications including; businesseurope.com, where he was managing editor, venturedome.com and yourpeoplemanager.co.uk,. He is also a regular contributor to KPMG Performance Plus and Baker Tilly magazine and has written for the British Chambers of Commerce, Small Business Service (DTI), Business Link for London, Lloyds TSB, Yell and Forum of Private Business.